Looking for something special? 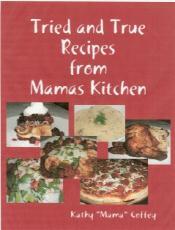 This recipe for stuffed pork chops is sure to please. 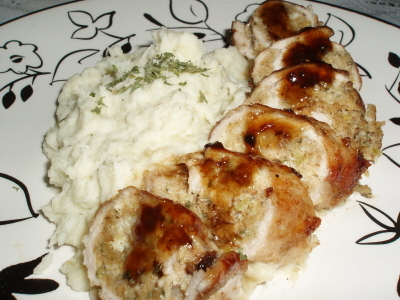 Pork Loin chops are pounded out thin so they are nice and tender and then stuffed with a delicious crab meat stuffing and for the finishing touch, they're drizzled with a delicious raspberry jalapeno sauce! 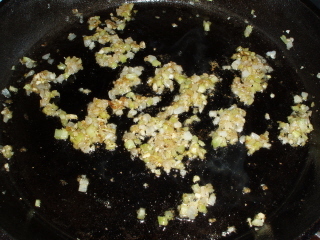 Saute the onions and celery in 1 tablespoon of Olive Oil over medium heat until onions are soft. Remove from heat. Add the garlic, lemon pepper and Old Bay Seasoning. Set aside. 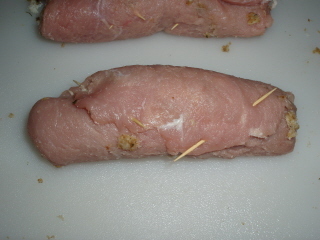 Trim all excess fat from the loin chops. 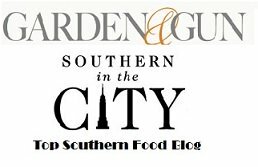 Use a medium-sized steel tenderizing hammer, and use the large diamond shaped end, and tenderize both sides of the chops. 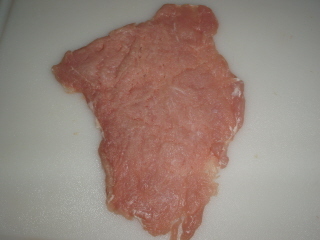 Place the tenderized meat on a sheet of waxed paper and cover with a second sheet. 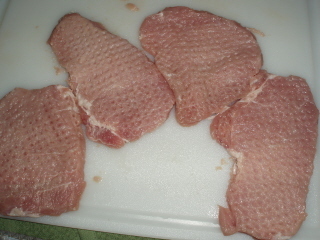 Next, use a large-flat meat tenderizer and pound the meat flat. 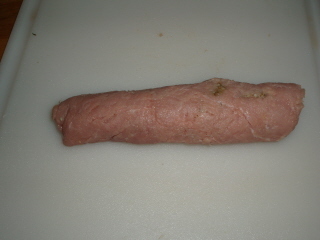 You want to flatten and double the diameter of the meat. Set aside. 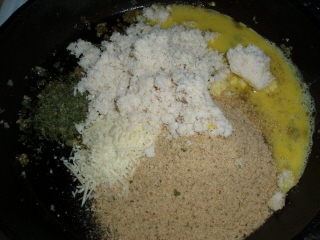 Gather together the rest of the ingredients for the stuffing. 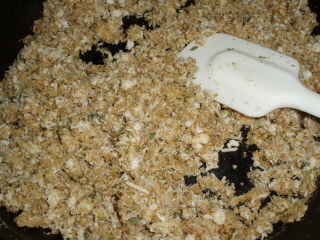 Add the remaining stuffing ingredients to the stuffing, including the 2 tablespoons of reserved crab liquid. 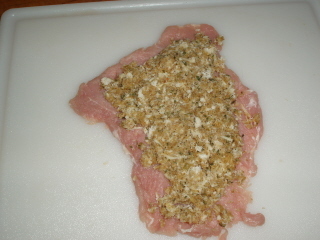 Spread 1/5 of filling onto each pork chop. 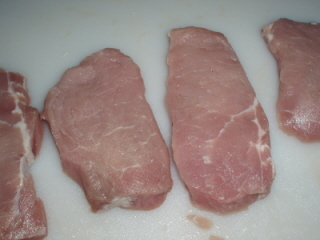 Roll up each pork chop starting on the long side. Insert two toothpicks into each roll. 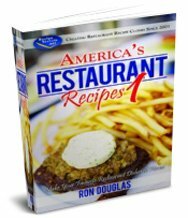 In a large cast iron skillet, brown the the rolls seam side down in 3 tablespoons of Olive Oil, turning to brown all sides. Remove to a platter. Remove toothpicks. De glaze the skillet with the 1/2 cup of chicken broth. 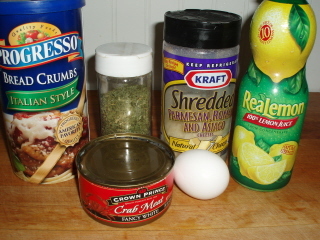 Add the jalapeno jelly and the raspberry spread. 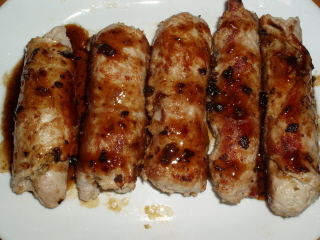 Pour the sauce over the pork rolls.